Planning ahead with plumbing options for possible water issues. When the driveway is paved, this garden bed would be isolated with all the water from this huge roof left to drain into this small front garden bed. Always try to complete as much of a features as you can before your lose your access. Once the garden wall is built, you will no longer be able to bring in equipment. I wonder how many of you have never heard of a landscaping installation plan before? Dream Yard is all about saving you time and money, so I figured I would throw a tip at you that even landscapers seem to learn the hard way more than once. Landscaping planning is all about practical designing, but an installation plan is all about sequencing your work in the most practical order. Just about everyone knows the rule that hardscaping comes before softscaping. This is general statement, not an absolute must do. This means you finish all your walkways, paths, patios, walls etc., before you plant your gardens and lawns. This all makes logical sense, but there are many exceptions to this rule. Remember the story of someone that painted themselves into the corner while painting a floor. They started in the wrong spot, and had to put footprints all over their nice work just to get out. This happens in landscaping all the time. Not the painting mind you, but tracking over work already done for no reason at all. There are numerous occasions when you may have to change up the order. I could write a whole book on how many labor hours I have seen eaten up from poor installation planning. Every landscape installation should have a properly sequenced installation plan. This should clearly outline the order in which the work is to be done. This takes anywhere from 5 minutes to an hour, but can save you thousands of dollars. This may also change as the job gets underway. You may find a more efficient way to do something. That's OK too. So here are the 3 main goals I try to achieve with an installation plan. It all starts with limiting how many times materials are handled. By limiting movement we mean the planning of deliveries like gravel, hardscaping materials, loam, etc. Have a plan where these materials can be placed or stored where you can work with them, or around them. If you are having things delivered when you are not home, clearly mark out an “X” where you want them dropped. You can also lay out a tarp for the products. You will have to make sure the person organizing the delivery trucks is clear on your instructions. Make sure your address is clear, or you gave a house description that can't be confused with any other nearby property. This is especially true in new construction areas where multiple landscape projects are on the go with houses that aren't clearly marked with a number yet. If there are a few different landscape companies working in the same area, believe me, there will be confusion. Never expect anyone else to know where your materials are to be delivered. 2. Don't track over completed work when you can avoid it. So here is a common one. You install your hardscaping features like a stone patio and walkway which block off access to half the yard. What if you still needed to install 3 large trees with 500 lb root balls, 5 yards of garden soil for the beds, edging, decorative rocks? And when all this was complete, you still have to grade the yard for sodding. Do you now risk driving over $10,000 worth of stonework with a bobcat? How are you going to handle the trees? That would be a lot of wheelbarrow trips for the soil, and the lost time would be substantial. Perhaps in this case you could have done this garden bed first? Maybe not, but the idea here is to have you think about the most efficient install sequence you can. Always try to complete as much of a feature as you can if you know access will be blocked off. Just like in one of our pictures above, we made sure to excavate out the clay, and install the good soil, before we built the garden wall. What sort of future plans do you have that you can add to your installation plan now? Will you be adding irrigation now, or in the future? What about other features like lighting, a fountain, or a waterfall? What about spots in your yard that are questionable for possible drainage issues? All these things are possibilities, so why not add them to your install plan now? Roughing these things in now can save a ton of work and money down the road. 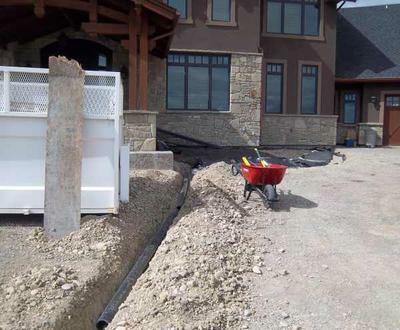 If you are involved in new construction, you may even want to work with the home builder to rough in wires, plumbing, or drainage pipes before permanent paved drives or walkways are done. In our project above, we installed a drain pipe before the driveway was paved. This is a rather large home and the water from the downspouts would be trapped in the front beds. Find a way to redirect it, or try to have a backup plan in case you do have problems down the road. A landscape installation plan is an essential part of being practical and efficient. It will save you time, money, and even grief down the road. That's my trick of the trade, so hopefully it will help you with your landscaping projects.